A woman like you who is in harmony with her spirit is like a flowing river, never stagnant. She goes where she wants to without pretence; and arrives at her destination prepared to be herself and only herself. People may forget what you said, they may also forget what you did but they will never forget how you made them feel. You are a living example that courage is the most important of all the virtues because, without courage, you can’t practice any other virtue consistently! Your deep strength and pure energy introduce you even before you speak! The worst thing you did was to be present with the ‘present’ with gratitude. You pursued the things you loved doing, and then did them so well that people can’t take their eyes off you! You on your own are enough with nothing to prove to anyone. Life is not measured by the number of breaths we take but by the moments that take our breath away. You’ve come a long way, baby. Having endured many hurdles, like the phoenix you rise! And I cannot pen down in words how proud I am of that little ‘cool’ moon-faced girl who took my breath away the very instant I first laid my eyes on her. You always gave better than the best to all the roles you were bestowed with but my most cherished character of yours is the role of the complete ‘Amma’ that you are, to the little bundle of pure joy called Aaradhya. Keep loving and spreading your magic. Two decades of Aishwarya Rai Bachchan- wow! Aashirwads and duas I wish for you more goodness and blessings; much more than your heart can contain! Love you. Jeete raho. 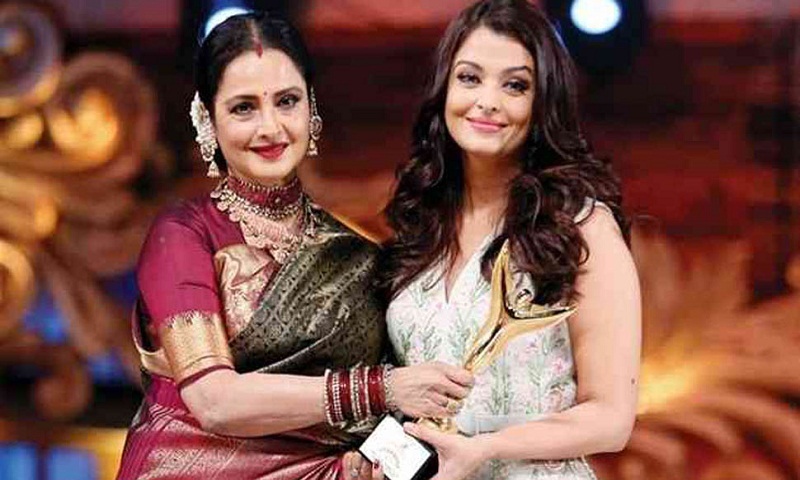 Rekha Maa"
Aishwarya, who after winning the Miss World crown in 1994 made her big screen debut in Mani Ratnam's 'Iruvar' has ever since been swooning the audience with her stellar performances and mesmerising good looks. On the latest, Aishwarya will soon be seen in Atul Manjrekar's 'Fanne Khan' which also stars Anil Kapoor and Rajkummar Rao in pivotal roles.